I got sent the Facebook ‘challenge’ of naming ten books that have stayed with you / made a mark / etc… last week. It was quite easy to come up with my ten – well it was tricky whittling it down to ten – but I was surprised that sneaking in was a little book that I’d bought on a whim and remains relatively unknown – at least nobody I know had heard of it or read it before I stumbled on it. Pereira Maintains is a delicious little ‘cult’ book and one I took up as part of my ongoing interest in reading novels based in those cities / areas I’ve visited. This is true of many of the books I’ve read lately and in each I’ve been happy to find a setting bought to life that is wholly different to that which I saw upon my visiting while still providing sufficient touchstones (in Pereira this would be the cobbled, hilly streets of Lisbon and its trams) to give sense of both familiarity with the location and a desire to return. The Lisbon that comes to life in Pereira Maintains is, of course, dramatically different in many ways to that which I’ve known on the occasions I’ve been fortunate enough to visit it – but then, given that it’s set in the late 1930s, you’d expect that. Tabucchi does do a wonderful job of bringing that city to life yet his expertise lies not in bringing a postcard to his readers but in creating an eerily vivid impression of life in a beautiful city during not so beautiful times. The story covers a surprising amount given its brevity yet within its couple-of-hundred pages Pereira Maintains slowly and dramatically builds up a story of intrigue and complexity before exploding in a dramatic climax. The characters are superbly created and this book is great for those looking for a quick read with a bit of bite – though be prepared to fancy an omelette at least once. There’s undoubtedly hundreds of lists of great “short novels”, those small but perfectly formed works of fiction. 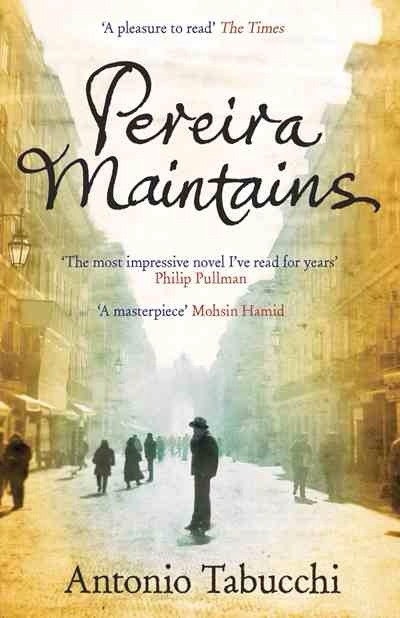 When I create mine Pereira Maintains will undoubtedly high up – it’s a fantastic little novel of a big story.